Thousands Admired Him for Posting this on Facebook About His Girlfriend! These days we often hear news about men cheating on their partners for some other woman or the other way around. Some also considered someone’s “virginity” as a measuring stick if they should go on with the relationship or not. Fortunately, there are men like this netizen who chose to love his girlfriend despite of her past experiences. 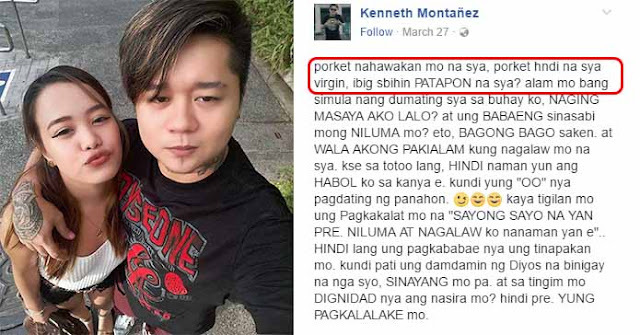 Facebook user Kenneth Montañez posted a very inspiring message where he proudly showed the entire world how much he loves his girlfriend. Moreover, he also called out the guy who claimed to be his girlfriend’s ex-boyfriend who bragged about him taking the girl’s virginity. Montañez took the guy to school and lectured him on how to respect a girl and how should they be treated. He also smashed the guy by calling him a lowlife and that bragging about being the guy who did his first won’t make him a better man than he is. Now, we can all say that love is not about who came first, but it is about who came and never left. See the full Facebook post below.